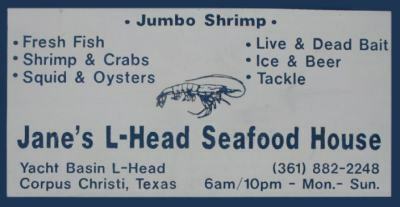 Jane's L-Head Seafood House and Bait Shop has been supplying fresh seafood to the Corpus Christi area for 28 years. The L-Head Seafood House operates 6 shrimp boats and supplies only the freshest; shrimp, Drum, Flounder, Redfish, Trout, Oysters and crab. In addition to offering freshest seafood Jane's handles many types of bait; cut bait, squid, shrimp, live shrimp, sea lice etc.